Wondering Where WBV Came From… Have A Look At This. The history of WBV usually begins with references to its use in the Russian space program. It had been observed that cosmonauts (as well as our astronauts) tended to lose bone density and muscular strength during their mostly zero-gravity space missions. 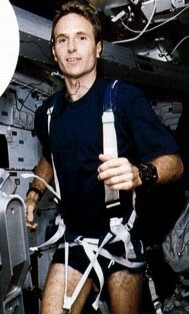 Russian scientist and former gymnast Vladimir Nazarov adopted the idea of vibrational training, using it to strengthen Russian cosmonauts during space flights. Vibration therapy was first introduced in the 1860s by Swedish physician Gustav Zander, who pioneered many mechanical exercise devices. His Zander Institutes were an early version of today’s health clubs. In 1895, Dr. John Harvey Kellogg— a health enthusiast invented a whole body vibration machine, initially configured as a chair. A standing version was brought out later. Returning to Nazarov, he discovered that not only did WBV stop the loss of bone density, it actually increased bone density, and strengthened muscle tissue, as well. Soon after, WBV was employed as a training aid for elite athletes. He spoke of a substantial increase in flexibility and strength after the application of vibrations in the athletes he studied. In 1999, Dutch Olympic trainer Guus van der Meer would bring this technology to the health and fitness industry. Within a short time, testimonials for his machine started to appear, from celebrities, rehabilitation centers, and famous athletes. Typically, the machines offer a selection of vibration frequencies—as high as 60 Hz. Golinsky is a natural bodybuilder, and believes that WBV has improved his strength, and has jump-started his workouts. His office is one of the few chiropractic centers to have WBV equipment, and his patients really seem to like it. Only a few minutes are needed to experience WBV. I know you’re thinking ‘There’s no way i can do all those things in just 10 minutes.’ Well you can! We know how hard it can be to be able to workout with such busy lives we lead, with working, looking after children, shopping etc. But, how hard is it to jump on a vibration plate for only 10 minutes?! You can always find 10 minutes in your day for a quick and easy workout. If it’s when the kids have gone to bed, when you’re waiting for the kettle to boil, or the oven to heat up! This 10 minute workout on the LookFab2 vibration plate will give you the chance to acheive the perfect body you want for your Summer holiday. Tones your body & Increase your muscle strength. 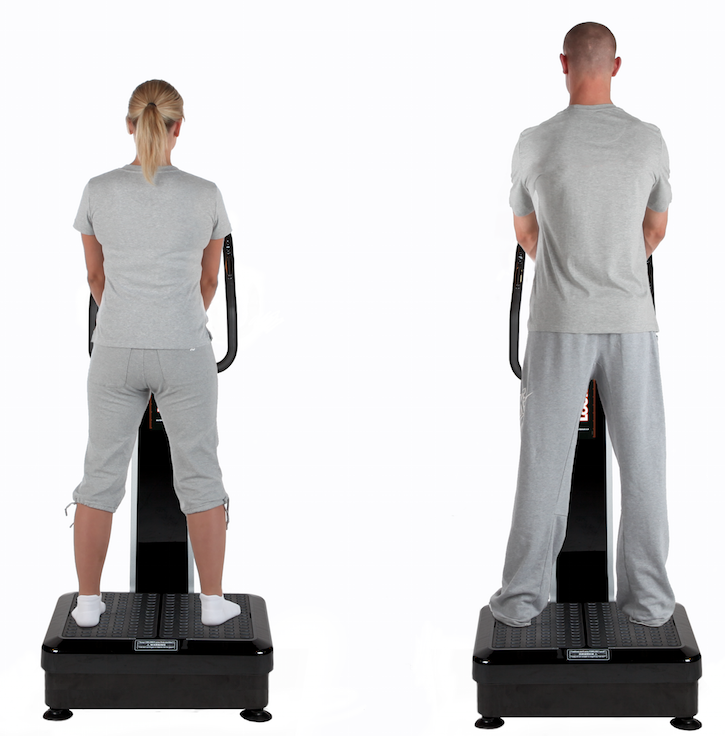 The LF2 and FLABeLOS Vibration plate pivots up and down in a seesaw motion at specifically programmed speeds. As your body tries to naturally stabilise itself, your muscles contract in order to keep you upright. It is this intensity and frequency of movement that causes the muscles to contract rapidly and this in turn tones the body and strengthens muscle tone. Burns fat. When exercising the human body needs energy. During and up to 24 hours after whole body vibration (WBV) training the body continues to use energy, this is called the ‘after burning” effect. This means that the body will burn “easy” fat tissue (such as subcutaneous fat) first. Which is more commonly known as belly fat. Improves blood circulation, lymphatic drainage, and cellulite. Because the muscles are contracting at such an intensity this in turn increases the blood flow throughout the body and therefore increases circulation. An increase in circulation has a positive effect on the lymphatic system in such a way that it helps lymphatic drainage which in turn helps to cleanse toxic buildup from the body, increase oxygenation in the blood and reduce cellulite. Builds bone density and helps to fight medical conditions. To try and explain this in simple terms WBV helps to increase bone density when the muscles contract they “bend” the bones which causes the cells in the bones to regenerate and cause them to gain density and strength. The more exercise you do on the vibration plate the stronger the bones get. Minimise lower back pain and joint pain. Strengthened muscles will offer support to the spine and painful joints and the increase in lymphatic circulation will flush away unwanted toxins ahd help reduce joint and spinal pain. Increase human growth hormone. WBV training can encourage your body to produce increased levels of human growth hormone, this helps in the repair and regeneration of damaged muscles, bones and other tissues. Anti Ageing and promotes hair and nail growth. WBV training improves oxygenated blood flow to feet, hands, skin and hair. Nutrients carried in this oxygenated blood along with waste elimination improves our cellular function which helps to slow down the ageing process and promotes healthy hair and nails. Improves sense of balance, flexibility and coordination. WBV evokes balance reflexes. This stimulation leads to improvements in balance, flexibility and improved power in muscles that are responsible for core stability. Elevates your serotonin levels to reduce stress and increase your sense of wellbeing. Whole body vibration has been known to increase serotonin levels whilst decreasing cortisol, a hormone produced by stress. Elevated serotonin helps to create a feeling of wellbeing, while the decrease in cortisol may reduce ‘belly fat’ which can be caused by stress. Increase mobility. Because WBV training uses the “contract – release” method to warm up and strengthen your muscles. This in turn will aid in increased mobility. An easy test to prove this is to try and touch your toes before using the Vibration plate and again after using the pate. You should notice a dramatic difference in your flexiblity. Improve varicose veins. Due to an increase in circulation the blood flow produced from continuous muscle contractions helps to improve the appearance of varicose veins. Visit http://www.lf2.co.uk for more info, or like us on Facebook, follow us on Twitter. We run special offers and competitions often so make sure you don’t miss out by following us on our social media platforms. It’s time to get on it and start to get ready for those beautiful Summer month’s heading our way (we hope anyway). Like many women and men out there we’re all looking for that ‘easy fix’ to drop a dress size without all the hard work, or even having to leave the house! Well we have the answer…. The LF2 vibration plate! It’s the quickest and easiest way to drop a dress and all it takes is just 10 minutes. A 10 minute workout on the LF2 is the equivalent of doing an hours workout at the gym. And it’s as simple as standing…Literally. Stand on the LF2, feet wide apart and let the LF2 work it’s magic! Within 3 to 4 weeks you could see a huge difference in your body. If it’s not an inch loss, then it’s weight loss, if it’s not weight loss then it’s cellulite reduction, if it’s not cellulite reduction it’s improvement in blood circulation (You get the picture). 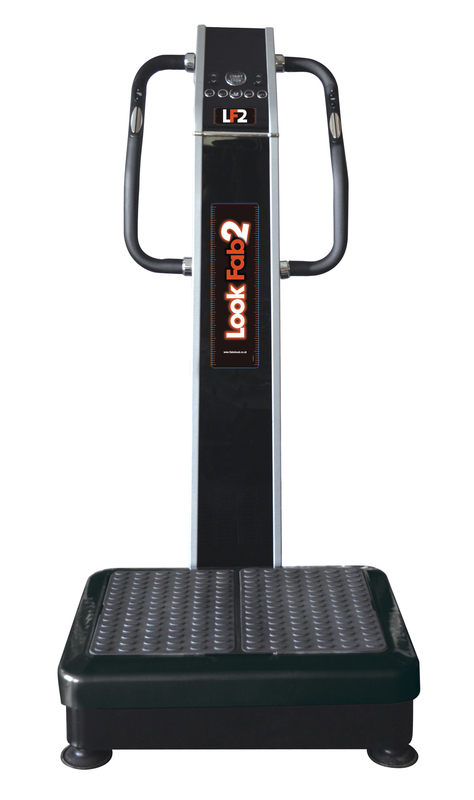 This machine is great to give you a head start and a great big push into looking great for the Summer holidays! As of writing this post, 12 weeks from now takes us up to 29th July, perfect timing for your Summer holiday. Renting for 12 weeks is the cheapest option as it’s only £12.25 per week, compared to 4 weeks at £18.75 per week. However, if 4 weeks* suits you better, then this is still a cheap option! Don’t forget, if you have one at home you can use it up to 3 times a day, rather than at a salon where you can only use it once a day. So straight away you get your money’s worth! We also provide an 8 week* option if your holiday falls a little bit earlier than July. *4 and 8 week options only available to Greater Manchester area only. So what to do now?? Give our office a call on 0161 344 0726, we’re open 9am – 5pm Monday to Friday, we will go through all the details thoroughly and take your information to plan a delivery date. 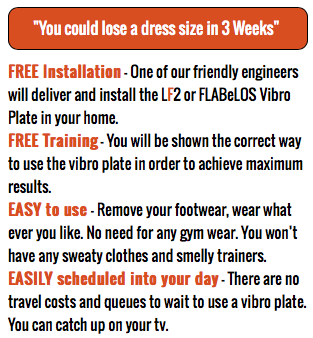 Alternatively visit www.lf2.co.uk where you can read more information about the LF2 vibration plate and all it’s benefits. Once you’re persuaded then you can even book and pay your deposit online. We also have a Facebook and Twitter page, updated regularly every day, and manned for any enquiries.